tails the lover. . Wallpaper and background images in the Miles "Tails" Prower club tagged: tails. This Miles "Tails" Prower photo might contain kabichi nyekundu. Omg, he must be so depressed. i know!i need a hug! .......-_- oh cut it out! let it go, kid! try to! please! u gotta! It's too hard for him to let go. He loved her so much. Tails: I don't know. I lost the girl I loved the most because she had to bring her clan back. Me: Don't worry, buddy. You'll make it through sometime. Tails: I guess you're right, Sam. I should just let it go. Sonic: Hey, is Tails OK? Me: Don't worry about it, Sonic. 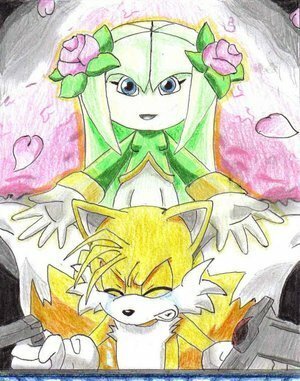 I was just telling Tails that he needs to let Cosmo go because she saved the galaxy for him. Sonic: OK. Thanks for comforting my little buddy, Sam.